Come take a journey back in time to the Ancient Egyptian period as we go on a hunt for the riches of Pharaoh’s that have been buried deep in the Ancient Pyramids – with Scarabs and Golden Treasure chests proving to be the ultimate discovery! This Pyramid has been constructed with 5 reels and 20 paylines, and you’ll not need pockets as deep as a Pharaoh to spin the reels as players of all slots bankroll levels will be able to enjoy it. Between 1p and £5 can be staked on each of the twenty paylines, meaning all paylines activated will cost you between 20p and £100 per spin. On top of this Egyptian Riches boasts an impressive 95.99% return to player percentage so it’s rather low in volatility. If you’ve played slots based on Ancient Egypt before you’ll know what to expect from the symbols that feature in Egyptian Riches. There is a total of ten symbols which boast bright and bold colours, but best of all there are no playing cards in sight! It’s the Egyptian Riches logo that is the Wild symbol, possessing the ability to substitute for all other symbols aside from the Bonus symbol – which is represented by the glamorous, gold-drenched Queen Cleopatra. In addition to these you’ll encounter Anubis (the God associated with embalming and the dead), the famous Eye of Ra (the symbol for protection, royal power, and good health), Falcon (representing Horus the Falcon God), Cat (sacred in Ancient Egyptian history), Scarab (a symbol as sacred to Egyptians as the cross is to Christians), Vase, Cartouche, and Ankh. A simple and straightforward pick ‘em game is the sole feature you’ll encounter in the pyramids as you hunt for riches in Egypt, and while this won’t appeal to many of you, it actually often results in a treasure trove of wins. Of course, you’ll first need to land three or more of the Cleopatra Bonus symbols in any position on the reel’s first, with the more that you land resulting larger Scatter wins and a higher valued multiplier. Should your luck be in and you trigger the feature with four Cleopatra’s you’ll receive 10x your stake along with a 2x multiplier while five Cleopatra’s triggering it sees you pick up 100x your stake along with a 4x multiplier – yep, she’s always a welcome sight on the reels – not only for her glamorous looks! This then sees you rewind the history books as you are transported deep into the stone clad walls of an Ancient Pyramid and faced with a choice of five Scarabs on the left hand side. Once you select one you’ll unveil a cash amount and will then have to select one of twenty-five Golden Treasure chests which then reveal a multiplier of between 1x and 6x your bet plus the cash amount that you unveiled selecting the Scarab. You continue selecting chests until you land in the ‘collect’ which sees the feature, but there is also a ‘pick another Scarab’ that further increases the values in the Golden Treasure chests. Overall the feature certainly offers the opportunity for some very large multiplier wins, but at the end of the day it’s only a pick ‘em feature and a free spins mode would have been much more appealing to the majority of players. Much like fellow Egyptian-themed slot Temptation Queen, Egyptian Riches is also a rather disappointing slot from WMS and a far cry from the most popular online slots based on Egypt such as IGT’s Cleopatra slot machine or Aristocrat’s Queen of the Nile slot machine – both of which boast more impressive designs and even more valuable bonus features to build an empire of cash for yourself! 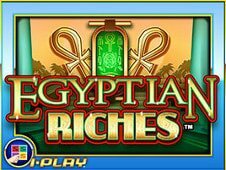 There is also no free spins mode in Egyptian Riches which is unusual in WMS slots and greatly detracts from any incentive to spin the reels, with a pick ‘em game being the sole feature - and although it often results in rich wins, in an age of slots that are packed with bonus features that alone simply isn’t going to cut it!